The iGEM Diversity Committee is looking for new members in 2019! Our committee works to make iGEM as inclusive as possible for people from all different backgrounds. For more information about our committee, please visit the Diversity Committee page. If you are interested in joining us, please share with us your ideas about the role that the diversity committee should have within iGEM, as well as some ideas for how our committee could improve the diversity of iGEM in the upcoming years. You can contact us at: diversity [AT] igem [DOT] org. Applications close February 20, 2019. You may be surprised to hear that 90% of iGEM’s funding comes from the Competition. While that allows us to run the Competition, it does not support expansion or new programs. We want to do more: We have the vision, and we need your help to see it through. We ask you now for your help to take iGEM to the next level. iGEM visionary and synthetic biology pioneer Tom Knight has already pledged his support, and today we are delighted to announce the creation of the Thomas F. Knight Matching Fund. This is the first time iGEM has raised money with the help of a matching fund, and we would like to invite you to take this rare chance to double your impact if you donate by December 31, 2018. Learn more. The Giant Jamboree dates for 2019 are finalized. Get ready to start your 2019 team! We are excited to announce today a new partnership between Ginkgo Bioworks and iGEM! Ginkgo’s five co-founders have a long history with iGEM. After participating in iGEM’s early days, Ginkgo was founded in 2008. Ten years later, they are excited to give back to their roots and seed the next generation of leadership in synthetic biology. As lead partners, Ginkgo and iGEM are delighted to formalize a relationship that began so long ago. Promega believes that mutual advancement can only be achieved by working in harmony and that the best benefits we receive come from the prosperity of our communities. For Promega, and for iGEM, this often means fostering education and advancement of the next generation of scientists and innovators – all of you iGEMers. Learn more about Promega's sponsorship and Team Grant opportunity for iGEM 2018 teams. We are proud to anounce the launch of After iGEM. Be a part of iGEM beyond the competition and join at after.igem.org. Teams from Lithuania, the Netherlands, and Taiwan earned top recognition as 310 student-led teams from 44 countries took part in the iGEM Competition. View our official press release. Make sure to visit the results page for the complete list of winners. 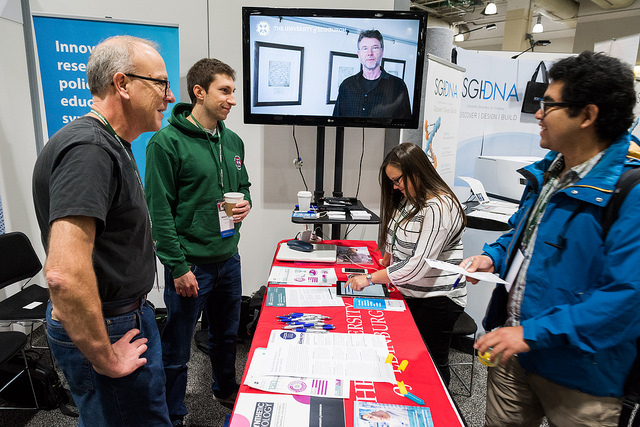 Exhibitor Booth: An amazing opportunity for our attendees to get to know you and for you to meet with the 3,000 members of our synthetic biology community, comprised of academics and experts from around the globe. Career Fair: Recruit for open position or graduate programs.As part of the iGEM 2017 Giant Jamboree weekend, iGEM is hosting a career fair event to help connect leaders in industry and academia with the synthetic biology community. Register before August 25, 2017 and be recognized in the event booklet! Through iGEMeta we reflect upon the achievements of the past and draw conclusions to improve the competition and synthetic biology. We hope that our efforts highlight the best of iGEM and capture the scale of what our community can and has already done. Map team progress by visiting iGEMeta. 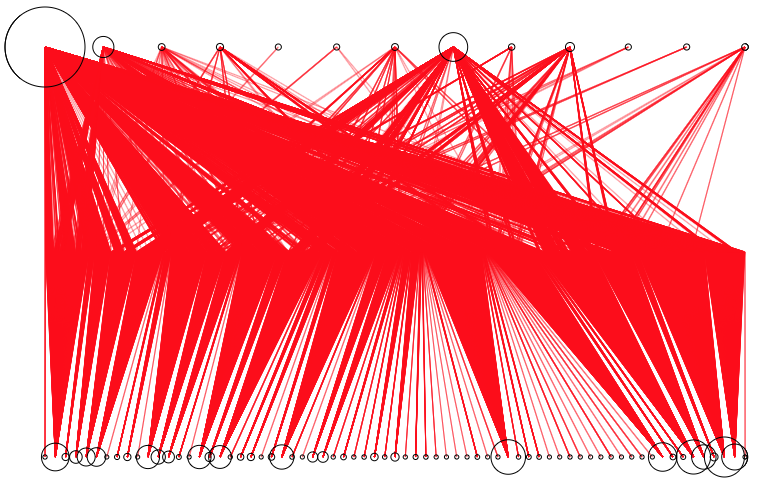 See how wiki edits impact team performance by viewing a 'waterfall' image, heat map of team behavior and collaboration diagram. Interested in attending the next SynBioBeta event? SynBioBeta San Francisco will be held on October 3-5, 2017 and all iGEMers (past and current participants) qualify for a 30% discount off their attendance fee. Learn more about this offer (and all Partner Special Offers) by visiting: page. 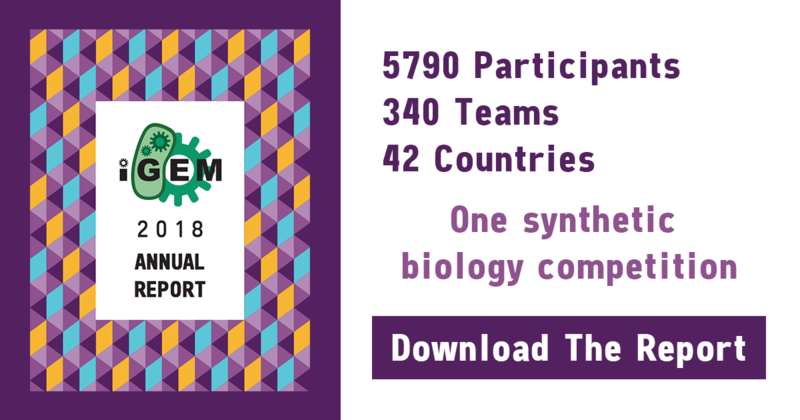 310 Teams are Participating in iGEM 2017! See where all the teams are from by accessing the interactive Google map below. iGEM is attending the 7th international meeting on Synthetic Biology on June 13 - 16 in Singapore. Make sure to stop by and say hello at our exhibitor booth and come hear iGEM's talks. With the goal of understanding regional dynamics, all participants were invited to discuss their experiences and views about iGEM and synthetic biology overall. The meeting also focused on enhancing the iGEM community experience beyond that of the competition and the Giant Jamboree. Look for more details on community engagement activities in the upcoming months as we prepare to introduce a new program for 2017 and beyond! iGEM's ground breaking work on safety and security was showcased at SXSW on March 15th. A panel arguing that it was time for a security update for biotechnology saw iGEM's work in this area being highlighted as how to effectively build a security culture and laying the foundations for more sustainable, scalable, security solutions. The panel included current or former iGEM track and committee chairs in software, human practices and safety and security. Team Registration for iGEM 2017 is OPEN! We look forward to welcoming you to iGEM 2017! To register you team just have your team PI create an igem.org user account, complete the team application and submit the team registration fee. Are you a High School team or Community Lab team? Please see your additional team registration materials. 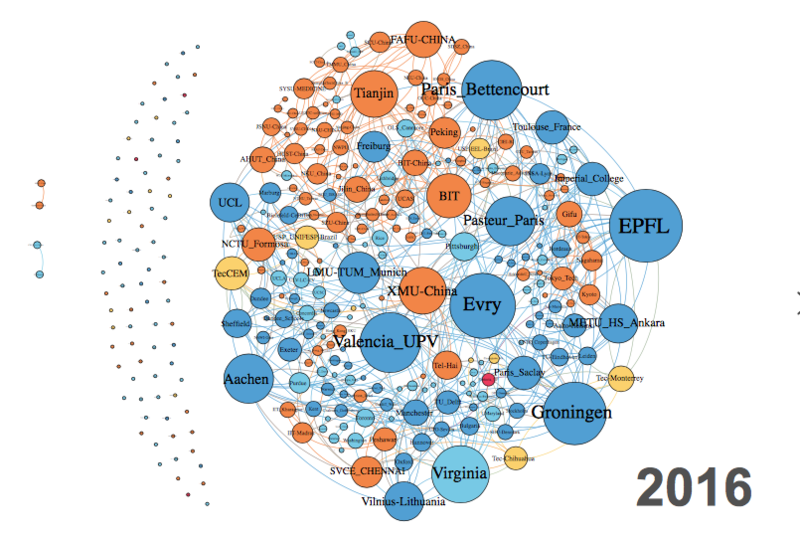 On the 28th of January, iGEM, PLOS and Breezio hosted the first online Peer-Review Jamboree for iGEM 2016 projects. Twenty-two teams submitted high quality manuscripts through the Breezio online platform to be considered for review in PLOS Collections. 73 users from 17 countries left almost four hundred comments for the authors of the articles. Please see our PLOS iGEM Collaboration page for more information about the event, links to papers and instructions on next steps for authors. We are proud to announce our Partner Sponsors & Special Offers for iGEM 2017. We welcoming back IDT's free custom DNA offer, Mathwork's free software kit (includes 12 products!) and Agilent's free SureVector kit. Visit the Partner's page to learn more and make sure to check back often for the latest updates. Hear what others are saying about iGEM. Visit the iGEM in the News page for a growing list of articles and videos. iGEM Headquarters is preparing to participate in Conference of the Parties to the Convention on Biological Diversity (CBD COP 13). In this event, delegates from all over the world will discuss synthetic biology and its research. iGEM is looking for enthusiastic candidates who would like to join us for this conference. Visit COPMOP page to apply. Exhibitor Opportunities at the Giant Jamboree! Event Exhibitor: Meet with todays brightest young minds and experts in synthetic biology. Career Fair Exhibitor: As part of the iGEM 2016 Giant Jamboree weekend, iGEM is hosting a career fair event on Sunday October 30 to foster relationships within the synthetic biology community. This unique opportunity offers top employers a chance to meet with iGEM participants and discuss career opportunities. The event takes place at the Hynes Convention Center in Boston, MA, USA. 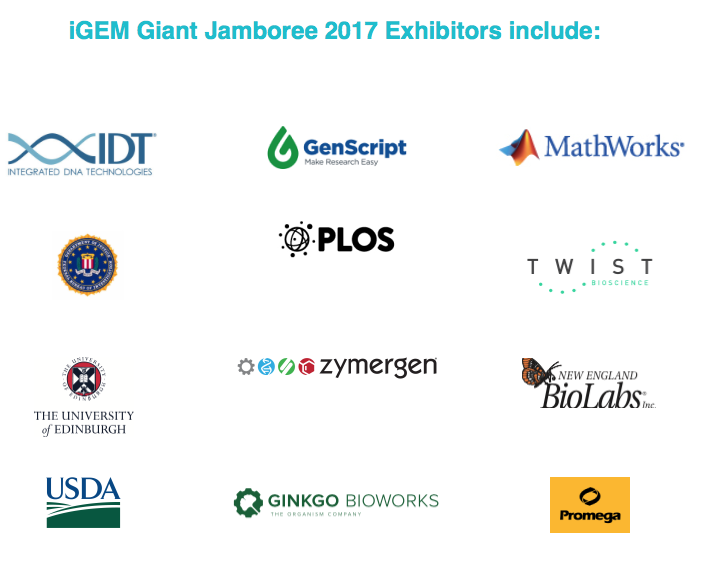 Become an exhibitor by contacting us at hq AT igem DOT org or visit Giant Jamboree event page to learn more. Join us at the iGEM 2016 Giant Jamboree, an annual event that showcases work from the iGEM season. All iGEM teams are invited to present their synthetic biology projects and compete for prizes. This year iGEM will host over 275 international, multidisciplinary teams who are eager to share and celebrate their work. The event takes place at the Hynes Convention Center in Boston, MA, USA. To register, please see Giant Jamboree Registration. Interested in joining the judging team for iGEM 2016? You can sign up to be notified when the judging application is open! 2016.igem.org/Judging.